The new Moto Z3 series of phones are right around the corner: Moto, a company now owned by Lenovo, has made it a tradition to unveil the Z series, its highest class of phones in the beginning of June and this year will be no exception. Luckily, you don't need to wait until the very announcement to learn what the new Moto Z3 phones will look like: rumors and leaked documents have painted a nearly complete picture of the upcoming devices. From Moto Mods to more powerful hardware and camera improvements, here is all we know about the upcoming Moto Z3. What looks like an early prototype of the Moto Z3 Play has already leaked out on the web, and it shows a super slim phone made of glass, but keeping those magnetic connectors that allow pairing it up easily with Moto Mods. The Moto Z3 series is in fact expected to feature one of the thinnest designs ever created at the expense of a slightly smaller than average, 3,000mAh battery. A slim body is essential for the company's modules because some of those Moto Mods modules are quite big, so in combination with a slim phone the whole concoction does not look overwhelmingly gigantic. One feature that you will not find on the Moto Z3 is a headphone jack. That's hardly a surprise: last year's Moto phones arrived without a headphone jack and this year again, you'd need to rely on USB-C for wired audio or just get a pair of wireless headphones. Back when the first Moto Z launched, the company promised that it will stick with the idea of Moto Mods for at least three years, enough time to guarantee developers of those modules some stability and to signal that this is not just a passing fad. We're glad to see that Moto sticks with its word and the Moto Z3 supports the Moto Mods idea. This is the third generation phone with them, so we don't know whether the company will continue using the mods in the future, but at the moment, the mods are alive and well. As to the specs, expectations are that there will be a few Moto Z3 models that will have a slight degree of variance in their spec sheet. 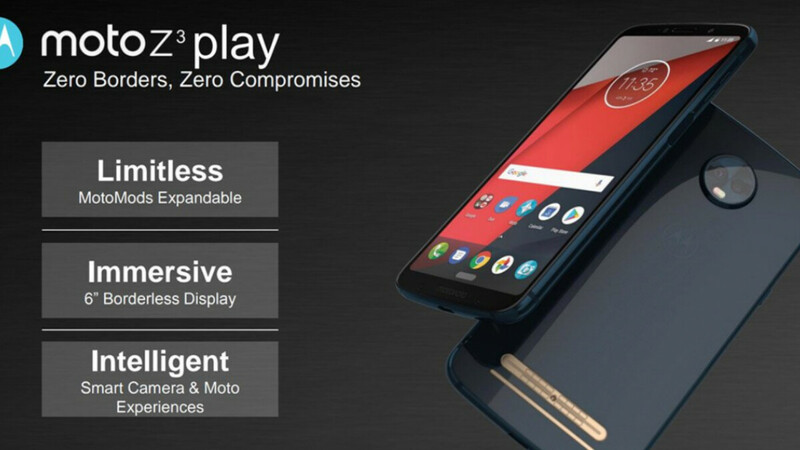 The Moto Z3 Play is the mainstream model that has leaked the most and while it is expected to be an impressive phone, it will not actually have flagship-grade processor inside it. The Moto Z3 Play is expected to launch with the Qualcomm Snapdragon 636 system chip along with 4GB of RAM and a 32GB/64GB storage options, a good combination, but definitely not on the same level as the top-tier Snapdragon 845. The base 32GB storage option also offers way less storage than mainstream flagships that now commonly come with 64 gigs, so we are at least content that Moto is offering a microSD card slot expansion option. On the back of the Moto Z3 Play, expect to find a dual camera system with support for portrait mode. The secondary camera will be used for getting the needed depth information in a picture, used to separate the subject from the background and creating that DSLR-like effect. There are quite a few other new features in the Moto Z3 camera: cinemagraphs will bring photos to live by animating a part of or the whole image; spot color will colorize just one part of the image and keep everything else in black & white; cutout mode will let you snap a picture and replace the background with a different picture, think of it as an easy collage maker; scan text will scan your documents or business cards; and finally, you will also have a full-on manual mode with various controls like ISO, white balance and shutter speed that give you a full manual camera ride. All of this paints a picture of a new Moto Z3 series of phones that does not quite fit the mainstream narrative. Luckily, this is also likely to entail a lower price tag than the dizzying $800+ prices of recent phones, so expect the Moto Z3 Play to be more affordable. The announcement date for the new Moto Z3 series is already set for June 6th, while the actual release date of the Moto Z3 series is likely to happen by the end of June.